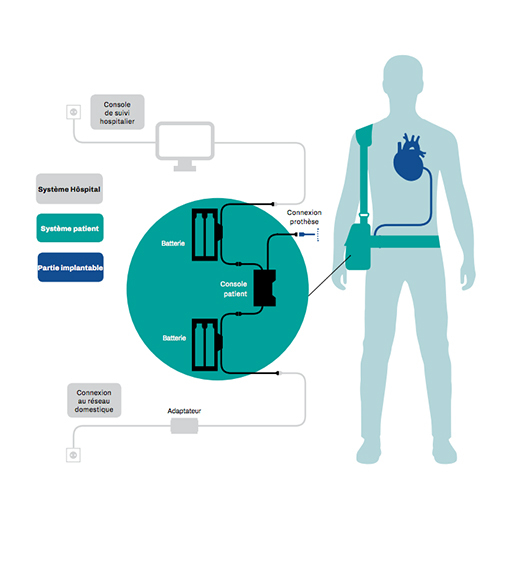 CARMAT (FR0010907956, ALCAR), the designer and developer of the world’s most advanced total artificial heart project, aiming to provide a therapeutic alternative for people suffering from end-stage biventricular heart failure, today announced its results for the first half of the year at June 30, 2018 and provides an update on its developments. Stéphane Piat, Chief Executive Officer of CARMAT, commented: “The first half of 2018 was marked by a significant acceleration of our project, as we have so far completed the enrollment of half of the patients in the PIVOTAL study and reached a decisive industrialization milestone with the opening of our new manufacturing site. The PIVOTAL study has now moved into its second phase. Indeed, the first phase of this study showed the ability of our prosthesis to provide effective support to patients suffering from end-stage heart failure. Furthermore, the successful heart transplant of the first Kazakh patient, after 8 months of support provided by the CARMAT heart, demonstrates that the latter can also be used in patients suffering from comorbidities that prevent an immediate transplant. Beyond this success, one of the main lessons lies in the fact that the size of our bioprosthesis allows us to target a broader patient population than initially expected, as it has been correctly implanted in patients with a smaller thorax size. CARMAT recorded no revenue over the first half of 2018, as its total artificial heart project is still in clinical development. The CE marking process, which is a prerequisite to marketing the product in Europe, is progressing in line with the Company’s expectations. the ramping up of the PIVOTAL study, with the training of the teams from the international investigation centers involved in the study and the acceleration in patient enrollment. Once the financial loss (-€455.4 thousand), exceptional items (-€2.7 thousand) and Research Tax Credit (€1.0 million) are taken into account, the net loss at June 30, 2018 was €18.9 million, versus a loss of €14.1 million over the six months to June 30, 2017.
drawdowns on the second tranche of the contingent equity line subscribed to with Kepler Cheuvreux, for a gross total of €4.0 million. Given the expiry of the initial contract and in order to continue to benefit from an equity financing reserve, CARMAT has signed a new contract, under identical conditions and for a sum equal to the unused balance, i.e. €25 million, with Kepler Cheuvreux, again acting as financial intermediary. This additional financing ability, to which Kepler Cheuvreux has committed to subscribe to on its own initiative providing the contractual conditions are respected, may be adjusted by the Company in accordance with its requirements and market conditions over the coming 36 months. This operation did not require a prospectus to be submitted to the AMF for a visa. These financial resources will allow the Company to continue its industrial and clinical development until it receives CE marking expected in 2019. In July 2018, CARMAT announced that patient enrollment in the first part of the PIVOTAL study had been completed, corresponding to the inclusion of the 10th patient, out of 20 planned for the entire study. the National Research Center for Cardiac Surgery (Astana, Kazakhstan) surgical teams successfully carried out the first heart transplant on a patient who benefited from the CARMAT heart for 8 months. This procedure, a world first, highlighted the possibility of using the CARMAT bioprosthesis not only as a definitive therapy, but also as a treatment option while awaiting a transplant (a bridge to transplantation), significantly expanding the targeted patient population. The feasibility of the bridge to transplantation was confirmed by a second heart transplant performed by the Astana teams in a patient who had benefited from the CARMAT bioprosthesis for 5 months. Following the analysis of the clinical data available to date on the first 10 patients, the health authorities of the countries participating in the trials have approved the continuation of the PIVOTAL study without any changes in the protocol. Patient enrollment in the second part of the study has therefore begun in the investigation centers, under the control of Principal Investigator, Professor Ivan Netuka (Director of the Cardiovascular Surgery Department at the IKEM institute, Prague, Czech Republic), and Co-Principal Investigator, Professor Finn Gustafsson (Rigshospitalet, Copenhagen, Denmark). Furthermore, CARMAT is still working intensely to expand the PIVOTAL study to other European countries and complete the implantations at the end of 2018. To date, 11 patients have been treated, i.e. over 50% of the planned number of patients in the study. The efforts of the clinical team are focused on enrolling patients that best meet the inclusion criteria in order to complete the study in line with the schedule and maximize the chances of success. the hospitalization time before patients can return home has been reduced to 35 days. Following the recent certification of its new automated manufacturing site in Bois-d’Arcy, near Paris, CARMAT now has an industrial site that meets the highest technological standards enabling it to produce up to 800 prostheses a year at full capacity. The assembly of the hybrid membranes with the help of industrial robots is already performed on site. In order to ensure a better therapeutic follow-up, CARMAT has initiated the development of a remote monitoring solution to record the cardiac parameters of patients as well as the CARMAT heart function data remotely. This solution was developed in collaboration with WISNAM (Acireale – Italy), an expert in the field of connected objects. CARMAT recently announced the appointment of Thierry Dupoux, previously Worldwide Vice President of Quality Assurance at LivaNova, as Senior Director of Quality Assurance. Following the appointments of a Marketing Manager and a Director of Manufacturing last year, the Company is thus continuing to expand its managerial team in key positions with experts who will support its transformation into an industrial and commercial company. First-half accounts were approved by the Board on September 27, 2018, and have been the subject of a limited review by the statutory auditors.